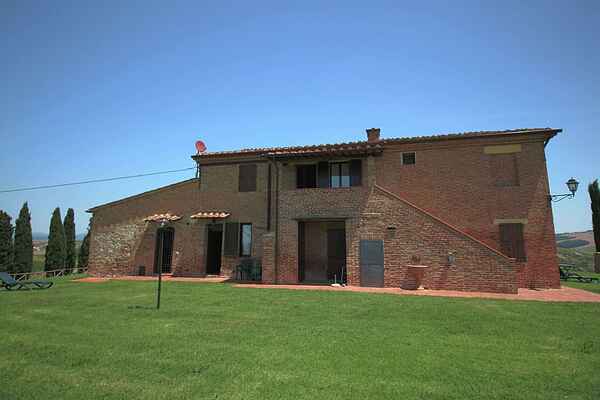 This rural farmhouse is located in the heart of the Crete Senesi on a hill. The agriturismo is accessible by a dirt road for 1.1 km. The view is unique and breathtaking. In total there are 7 apartments. Each apartment has a private terrace. The apartments have terra cotta tiles on the floor, wooden ceiling beams and are decorated with wooden furniture. It radiates the typical Tuscan rural atmosphere. It is an ideal place for rest and relaxation. The Crete Senesi, where this agritourism is located, is a hilly area southeast of Siena and is certainly one of the most unique and fascinating areas of Tuscany with colors changing every season. The area consists of small, rounded hills and includes the towns of Asciano, Buonconvento, Monteroni d'Arbia, Rapolano Terme and San Giovanni d'Asso. Wonderful day trips to Siena (13 km), Montalcino (40 km) and a thermal pool (15 km). The agriturismo is specialized in organic agriculture. Enjoy and relax in this rural Tuscan farmhouse with swimming pool. Visit Siena! There is much to see including the Piazza del Campo, Siena Cathedral, the Abbey of San Galgano and the cathedral of Siena. In the town of Asciano you can visit the castle Gallico and Abbey Monte Oliveto Maggiore and the museum Cassioli. Crete Senesi: Take the road from Monteroni d'Arbia to Asciano. At every turn you have a breathtaking view! The colors change depending on the season. The sunset is beautiful.